Sangyé Tönpa Tsöndrü Sengé was born to a Bönpo family. At his birth, the adept Amogha flew down from the sky to offer wondrous prophecies about the new born. He wanted to practice Dharma from a very young age and became a monk at the age of thirteen. He took his vows from the famous Lama Tsari Repa and he was given the name Tsöndrü Senge. But Sangye Tönpa was able to serve Tsari Repa only for a short time before he died. After studying with several Lamas, he felt the need to receive teachings from a genuine secret yogi. He set out to meet Lama Rigongpa who was recommended by both Lama Zhupa Nakpo and the teacher Doktön. Sangye Tönpa then became the sole lineage holder of Rigongpa’s oral instructions. He received the Dream Yoga, Inner Heat, Illusory Body passed down through all the lineage masters from Vajradara to Rigongpa. He perfected very powerful Dream Yoga and was able to perform the Dream Yoga practices of training, multiplication, emanation and transformation, a feat even the Lamas of the lineage could not match. He had the vision of Vajrayogini, who gave him both common and extraordinary siddhis and gained the siddhis to transform foul-tasting barley beer into the finest flavor, multiply its quantity and change its nutrition and potency. All those who drank his transformed beer were cured of illness, evil spirits and their practice immediately improved. Sangye Tönpa had a vision of the five deity mandala of Chakrasamvara and practiced virtue by reading and writing as much dharma as possible. He set up both a school and meditation center. To his patrons both men and women, Sangye Tönpa propounded the vinaya code of discipline and oral teachings from both the new and old traditions. Because of his pervasive activity he gathered many disciples from China and India. Among his disciples Shangtönpa and Kedrup Shönu were the best. Before his death Sangye Tönpa’s disciples asked what they should do, and he replied, “Do not cling to fame, glory or happiness in either this life, or in future lives, don’t get mixed up in the eight worldly concerns. Instead go to the mountains and practice Dharma! The extremes of mental imputation do not need to be cleared from the outside, rather the qualities of enlightenment will arise from within.” He kept practicing, teaching and giving empowerments until his death. 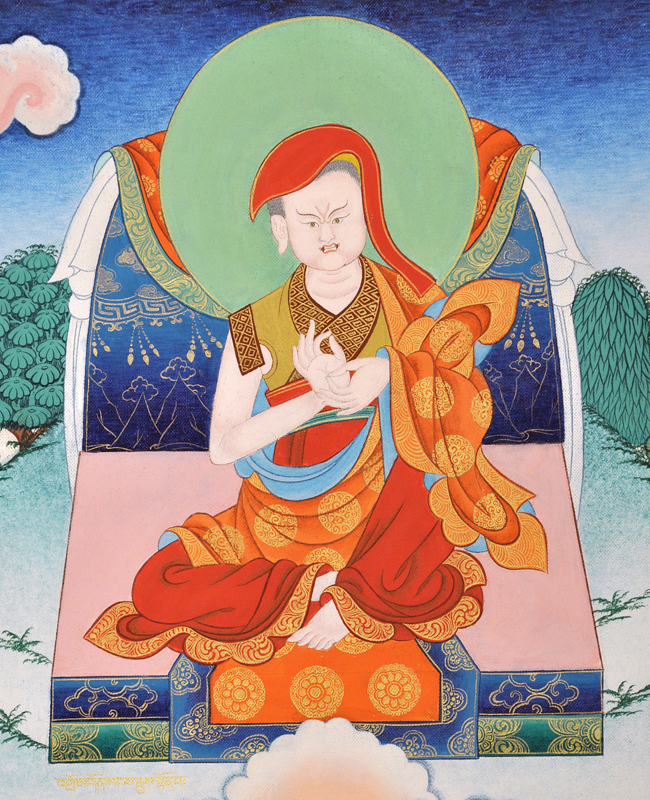 According to his Lama Rigongpa’s last wish Sangye Tönpa left for Rigong to die near the relics of his lama. Sangyé Tönpa is the last of the Initial Seven Jewels of the Shangpa Kagyü.